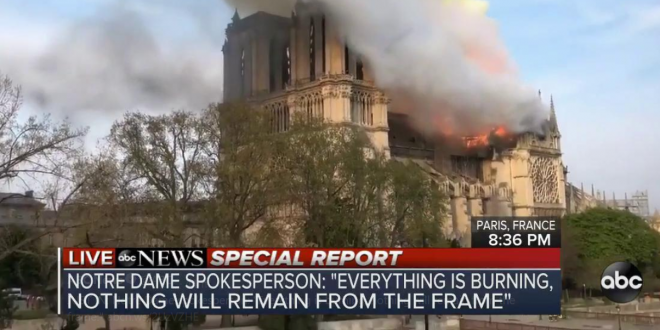 Notre Dame Cathedral Likely A Total Loss, Scramble To Save Artwork, "Nothing Will Remain From The Frame" - Joe.My.God. The fire burned for hours, virtually unabated despite the efforts of hundreds of firefighters. The flames continued to glow when darkness fell. “A special mission has been launched to try to save all works of art that can be saved,” Emmanuel Grégoire, first deputy to the mayor of Paris, said on French TV. “Everything is burning, nothing will remain from the frame,” Notre Dame spokesman Andre Finot told French media. The cause was not immediately known, but officials said it could be linked to renovation work. The cathedral is in the midst of a $6.8 million renovation project. From The Associated Press: The massive Notre Dame fire has spread to one of the cathedral’s iconic rectangular towers.